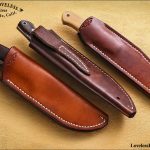 The finest knife in the world is worthless without a good sheath. 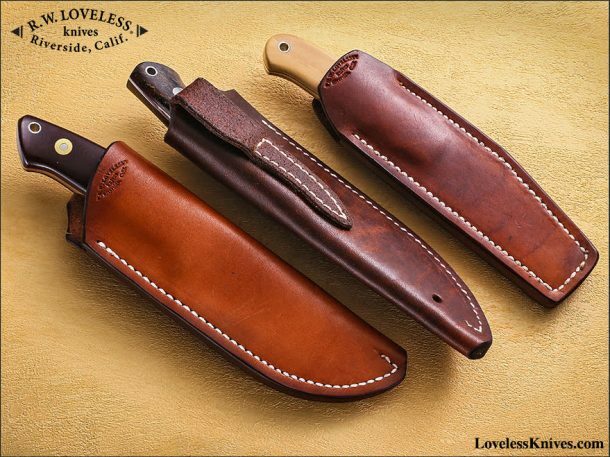 We make Loveless sheaths from heavy 8 – 9 ounce cowhide shoulder leather. We hand fit each knife to its own pouch style sheath by wet forming. After thorough drying, each sheath is dipped in our own blend of waterproofing & preserving oil. In use, a Loveless Knife comes out of its sheath with one hand. No keeper strap in the way to be fumbled with or carelessly cut. The knife,in its sheath, should stay in one place on your belt so you can count on easily getting to it when you reach for it. When you place your order tell us what belt width you will be using and we can make the belt loop of the sheath a snug fit for you.